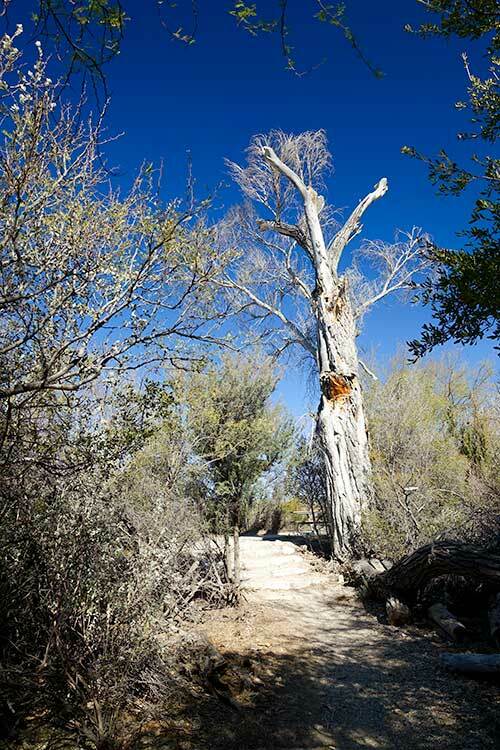 The Chihuahuan Desert Nature Trail in Big Bend National Park isn’t the most exciting trail you’ll hike while you’re there, but its probably the best first trail for you to take when you get to the park. 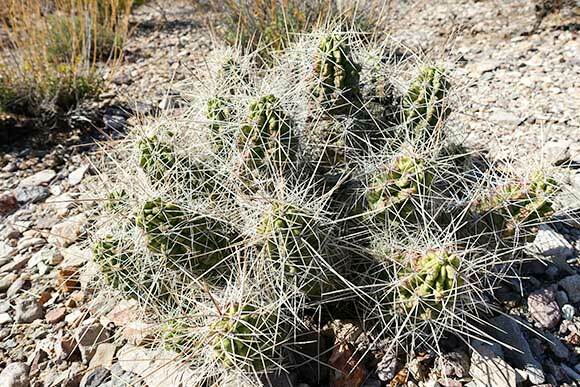 Especially if you’re not that familiar with the Chihuahuan Desert. 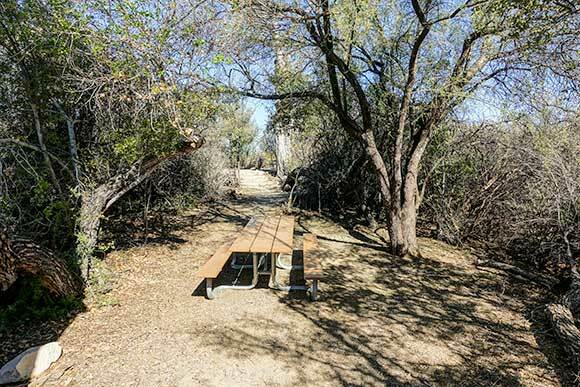 This short trail starts out at Dugout Wells, a historic desert oasis, loops out into the desert then back into the lush area around the spring. Along the path you’ll see various small signs describing different aspects of the desert environment that you’re standing in. 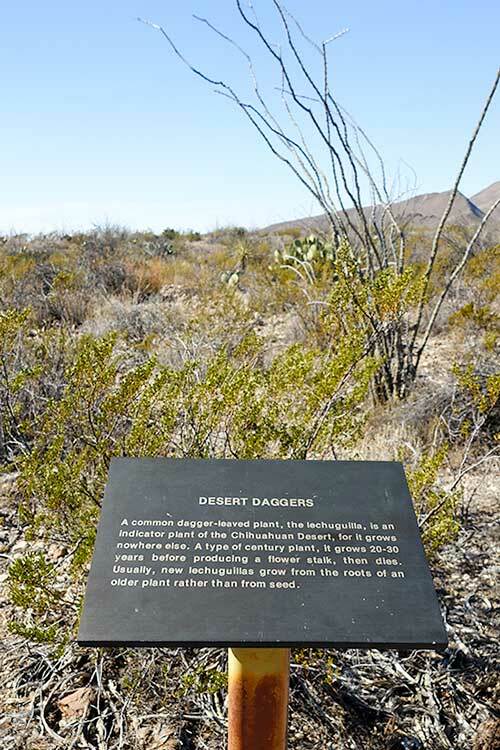 These small signs will help educate you on the desert ecosystem and will go a long way in helping you to appreciate the rest of your trip to Big Bend National Park. To get to the Chihuahuan Desert Nature Trail trailhead from the Panther Junction Visitor’s Center, take a right (East) out of the parking lot. Drive about 6.4 miles down Highway 118 to a left hand turn toward Dugout Wells (29.266657, -103.135128). Prior to your turn on the left, you should see a sign indicating Dugout Wells is coming up. Take a right on this dirt road and head down to the parking area at the end (29.272466, -103.135858). The trailhead is just past the parking area (to the East) on the North side of the road (29.272177, -103.136424). Dugout Wells is also a great spot to stop and have a picnic at one of the tables in the rare shade provided by the tall trees in this area. Once you begin the trail, keep an eye out for the small trailhead signs that we mentioned above. These are the key points to this trail. 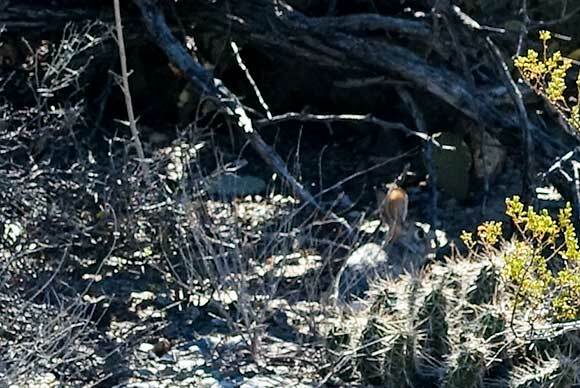 As you move along the trail, the biodiversity of the Chihuahuan Desert will start becoming more apparent. 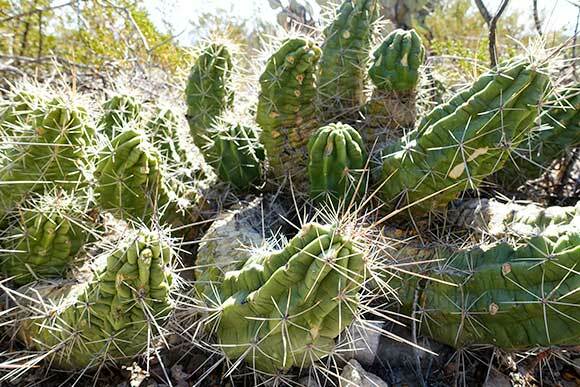 The desert will stop appearing to be a lifeless wasteland as you realize that life is thriving all around you. As you move slower and start looking, you’ll begin to see the desert in a new light. 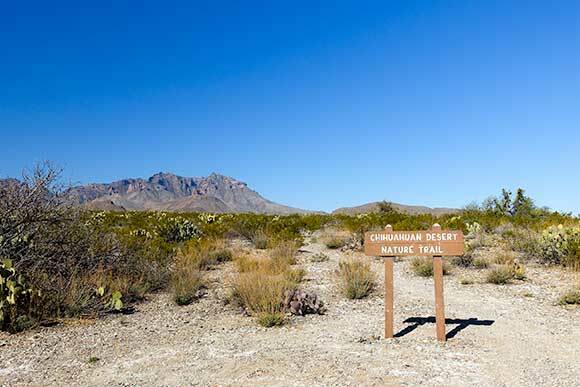 As you walk along the trail you’ll be looking out onto the Eastern extent of the Chisos Mountains. 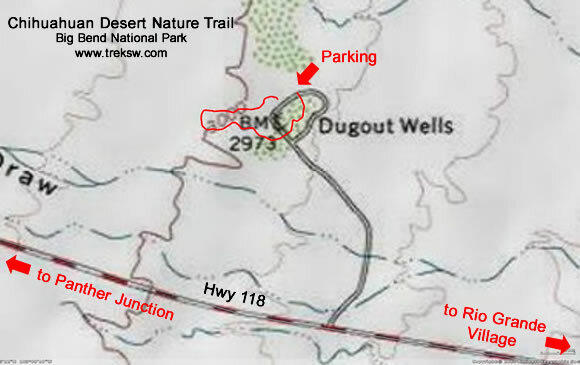 About three-quarters of the way through the trail, you’ll start making your way back down to the Dugout Wells Area. You’ll see the vegetation dramatically change due to the abundance of water from the spring in this area. Again, if you’re new to the region, this is a good trail to get started on. 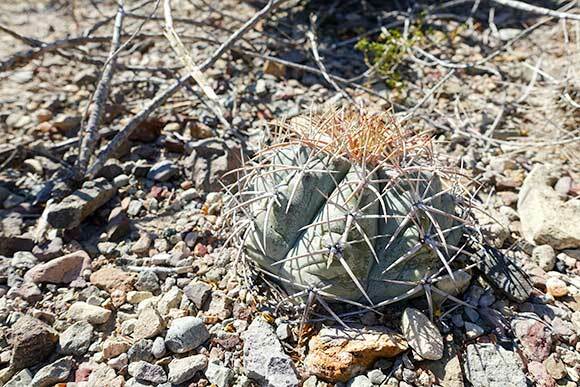 Its a great introduction to the desert environment and only takes a little time to get from one end to the other. Just take it slow as you move along the trail so you can read all of the informational signs. To truly appreciate Big Bend, it helps to move slower than you would in your normal life. The desert moves at a very slow pace. So should you while you’re here. During the Spring and Summertime, this trail can get very hot. Try to hike it first thing in the morning if you’re out during the hotter parts of the year. 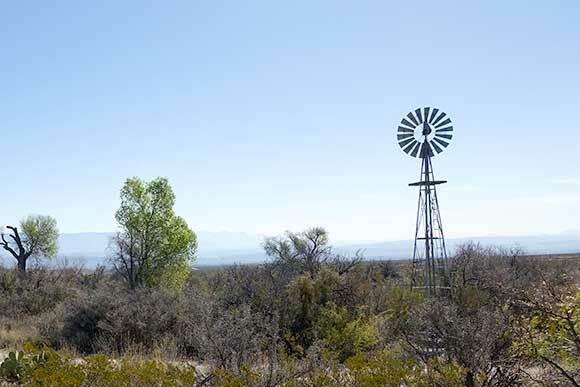 It doesn’t look like it now because all that’s left is a single windmill slowly pumping water to the surface, but at one point in time Dugout Wells was considered the “cultural center of the Big Bend” by the residents of the area in the early 20th century. It is thought that Dugout Wells originally got its name from the early inhabitants that dug out the area surrounding the natural spring that occurs in the area. 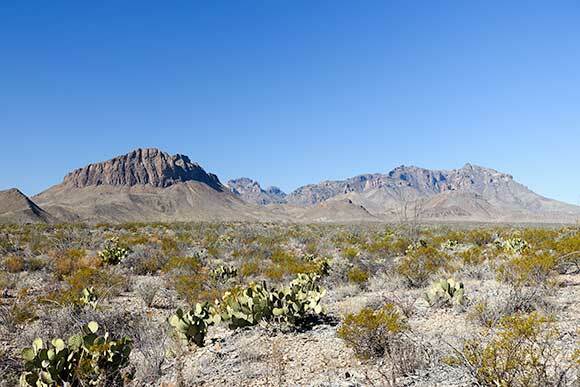 This area of Big Bend National Park was popular with travelers well before the white settlers arrived. The Comanches had a trail that passed nearby and would stop here to camp on their journeys through the area. When the white settlers did start arriving, they recognized the value of this area and built a small community, with a schoolhouse (the first in the region) finally being erected around 1911. The schoolhouse also served as a meeting place for the local residents. In 1915, William James Green bought the land and ranched here with his family. Four of his daughters taught at the schoolhouse until it finally closed in 1933. Around 1937, the building itself was moved to San Vicente, a settlement located near the present day East side of the primitive River Road. At its height, Dugout Wells hosted about a half dozen buildings.